Emberger syndrome is a rare blood disorder that results in a variety of clinical outcomes and is characterized by lymphedema and a predisposition for acute myeloid leukemia. Loss-of-function mutations in transcription factor GATA2 are causative of Emberger syndrome, implicating GATA2 activity in the regulation of lymphatic vasculature development and valve maturation. GATA2 mutations are also associated with several other hematological disorders that do not result in lymphedema, suggesting differential targets and regulation of GATA2-dependent genes in the lymphatic and hematological compartments. Jan Kazenwadel, Kelly Betterman, and colleagues at the University of South Australia demonstrate that Emberger-associated GATA2 mutations result in lymphovenous valve dysfunction. GATA2 directly regulated the transcription factors PROX1 and FOXC2, both of which are required for lymphovenous valve development. Specifically, GATA2 bound to regulatory elements within the PROX1 promoter to activate transcription, and GATA2 binding at PROX1 was greatly perturbed by expression of Emberger-associated GATA2 mutants, but not WT GATA2 or GATA2 mutants from patients lacking lymphedema, in human lymphatic endothelial cells (hLECs). Furthermore, murine models revealed that GATA2 is required for lymphatic vasculature and valve development. Lymphatic endothelial cell-specific deletion of Gata2 reduced expression of PROX1 and FOXC2 at sites of lymphovenous valve initiation, resulting in dysmorphic and dysfunctional valves, edema, blood-filled lymph, and poorly organized lymphatic vasculature. Taken together, the results of this study identify a crucial role for GATA2 in lymphovenous valve development and lymphatic function. 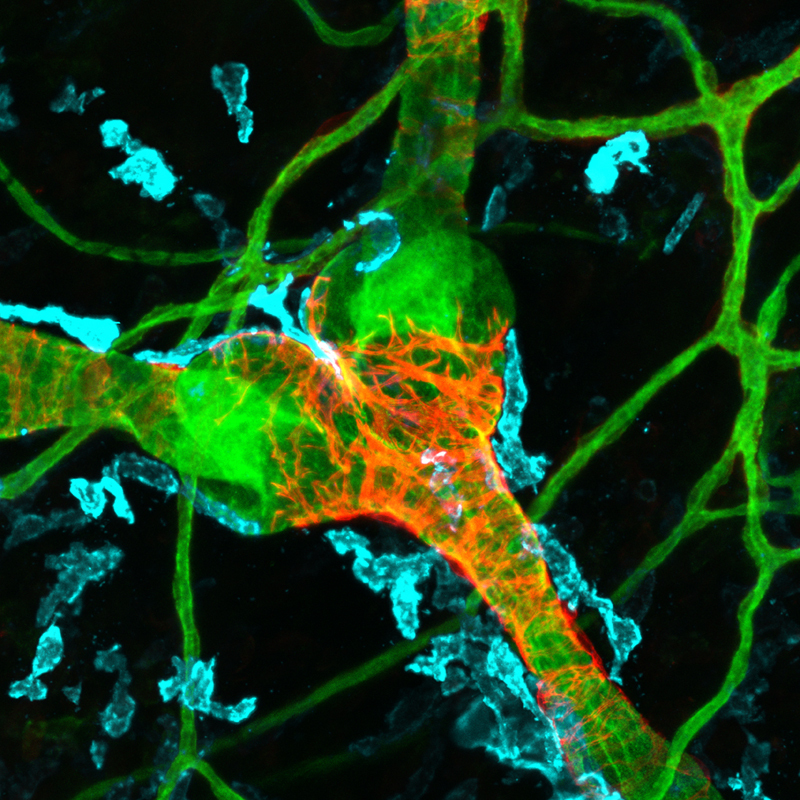 The accompanying image shows a collecting lymphatic vessel (green) invested with vascular smooth muscle cells (red). Macrophages (cyan) are closely associated with the vascular smooth muscle cells. Note the prominent lymphatic vessel valve leaflets (green). Read the accompanying Commentary “Lymphatic vessel development: fluid flow and valve-forming cells” by Tsutomu Kume and the related article “Lymph flow regulates collecting lymphatic vessel maturation in vivo” from Daniel Sweet and colleagues. Citation Information: J Clin Invest. 2015;125(8):2979-2994. https://doi.org/10.1172/JCI78888. Heterozygous germline mutations in the zinc finger transcription factor GATA2 have recently been shown to underlie a range of clinical phenotypes, including Emberger syndrome, a disorder characterized by lymphedema and predisposition to myelodysplastic syndrome/acute myeloid leukemia (MDS/AML). Despite well-defined roles in hematopoiesis, the functions of GATA2 in the lymphatic vasculature and the mechanisms by which GATA2 mutations result in lymphedema have not been characterized. Here, we have provided a molecular explanation for lymphedema predisposition in a subset of patients with germline GATA2 mutations. Specifically, we demonstrated that Emberger-associated GATA2 missense mutations result in complete loss of GATA2 function, with respect to the capacity to regulate the transcription of genes that are important for lymphatic vessel valve development. We identified a putative enhancer element upstream of the key lymphatic transcriptional regulator PROX1 that is bound by GATA2, and the transcription factors FOXC2 and NFATC1. Emberger GATA2 missense mutants had a profoundly reduced capacity to bind this element. Conditional Gata2 deletion in mice revealed that GATA2 is required for both development and maintenance of lymphovenous and lymphatic vessel valves. Together, our data unveil essential roles for GATA2 in the lymphatic vasculature and explain why a select catalogue of human GATA2 mutations results in lymphedema. Citation Information: J Clin Invest. 2015;125(8):2924-2926. https://doi.org/10.1172/JCI83189. Hemodynamic forces regulate many aspects of blood vessel disease and development, including susceptibility to atherosclerosis and remodeling of primary blood vessels into a mature vascular network. Vessels of the lymphatic circulatory system are also subjected to fluid flow–associated forces, but the molecular and cellular mechanisms by which these forces regulate the formation and maintenance of lymphatic vessels remain largely uncharacterized. This issue of the JCI includes two articles that begin to address how fluid flow influences lymphatic vessel development and function. Sweet et al. demonstrate that lymph flow is essential for the remodeling of primary lymphatic vessels, for ensuring the proper distribution of smooth muscle cells (SMCs), and for the development and maturation of lymphatic valves. Kazenwadel et al. show that flow-induced lymphatic valve development is initiated by the upregulation of GATA2, which has been linked to lymphedema in patients with Emberger syndrome. Together, these observations and future studies inspired by these results have potential to lead to the development of strategies for the treatment of lymphatic disorders. Citation Information: J Clin Invest. 2015;125(8):2995-3007. https://doi.org/10.1172/JCI79386. Fluid shear forces have established roles in blood vascular development and function, but whether such forces similarly influence the low-flow lymphatic system is unknown. It has been difficult to test the contribution of fluid forces in vivo because mechanical or genetic perturbations that alter flow often have direct effects on vessel growth. Here, we investigated the functional role of flow in lymphatic vessel development using mice deficient for the platelet-specific receptor C-type lectin–like receptor 2 (CLEC2) as blood backfills the lymphatic network and blocks lymph flow in these animals. CLEC2-deficient animals exhibited normal growth of the primary mesenteric lymphatic plexus but failed to form valves in these vessels or remodel them into a structured, hierarchical network. Smooth muscle cell coverage (SMC coverage) of CLEC2-deficient lymphatic vessels was both premature and excessive, a phenotype identical to that observed with loss of the lymphatic endothelial transcription factor FOXC2. In vitro evaluation of lymphatic endothelial cells (LECs) revealed that low, reversing shear stress is sufficient to induce expression of genes required for lymphatic valve development and identified GATA2 as an upstream transcriptional regulator of FOXC2 and the lymphatic valve genetic program. These studies reveal that lymph flow initiates and regulates many of the key steps in collecting lymphatic vessel maturation and development.